There is something really special about the first spring fish of the year, after the long absence of catches during the winter, the line tightens and the heart races. Spring salmon have a special beauty that other fish just cannot match. The early fish are not usually very big, averaging around 10 pounds, but as the spring run increases the fish get larger, with 20 pounders expected in May. 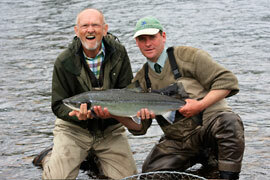 The River Spey, famous for Speycasting and one of Scotland’s big four salmon rivers. However, its major attraction is its size and the strength of its stream – in the middle and lower river it falls on average 12 feet per mile – the greatest of any British river. There is a host of information on the FishPal website to help you arrange your fishing on the Spey or Avon and organise your visit to Moray.